The deep blue seas are dark – but not silent. Marine animals such as whales and dolphins depend on their hearing for finding food, communicating and protecting themselves from predators. Sounds travel through water for greater distances than sight. “Listening” is as important to underwater mammals as “seeing” is to us humans. At all times, these sea animals are aware of exactly what is going on around them through their great sense of hearing. 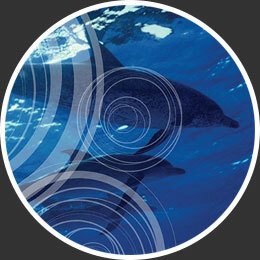 Marine mammals, fish and birds can all be affected by the noise from ships and boats. One problem is that more and more noise at sea is drowning out the sounds that marine animals need to listen out for. For example, noise from the propellers of large ships can confuse whales and cause them to get stranded on beaches. To help tackle this problem, IMO has been working with the shipping industry worldwide to cut down on the noise that comes from ships as they travel around the oceans and seas. Guidance has been written to help reduce the impact and harmful effects on marine life from underwater noise caused by ships. There is also a new IMO regulation that says new ships must be built so that they reduce on-board noise and protect seafarers and others working on board from harmful noise, as well as being less harmful to marine life. In addition to the ships engines, there are lots of places on ships that cause noise on board as well as being passed into the waters they sail through. This includes machinery spaces, control rooms, workshops, accommodation and other spaces on board. We sometimes hear in the news about whales and dolphins that have landed up on our beaches and become stranded. Unfortunately they often die. What can you find out about why this may happen? How do you think ships and boats can be built to help reduce noise? Have a look at this poster from Port of Vancouver on the effects of vessel underwater noise on whales and what mariners could do about it. Have a look at these images and links to web pages to find out more.